We’ve been all a-buzz about bee artwork on Inhabitat, so we were instantly drawn when we saw artist Marina Zumi’s giant rainbow honeycomb mural. The vibrant 800-square-meter multicolored artwork covers the facade of a large corner building in Halle, Germany. The piece, called the ‘Honeycomb of Life,’ took 12 days to complete and was created as part of the All You Can Paint festival. The All You Can Paint Festival Project was part of a revitalization effort for Halle, a German city with a declining population. After Zumi agreed to participate, she was given a difficult building canvas to work with; although the facade’s large size was not a problem, creating a mural around the building’s many windows posed a formidable challenge. Zumi resolved the dilemma by creating a honeycomb design. The painting process started early November of last year. Zumi’s artistic vision called for a bright and colorful mural that represented the many personalities of Halle. She also included a portion of the night sky in her piece to symbolize change and innovation. 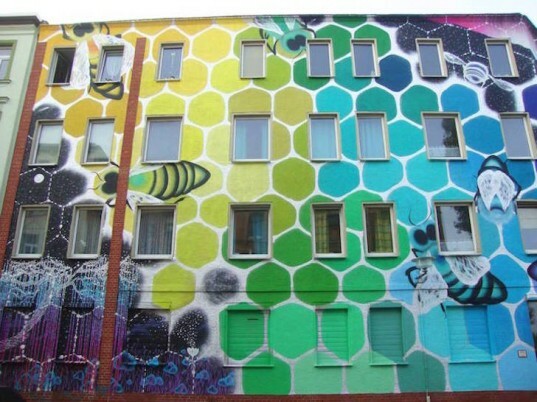 When Zumi arrived at Halle, however, she was so inspired by the work of the All You Can Paint Festival committee that she added 11 large bees into the mural, each representing a committee member. The ‘Honeycomb of Life’ mural also includes miniature landscapes and other small beautiful details. The All You Can Paint Festival Project was part of a revitalization effort for Halle, a German city with a declining population. After Zumi agreed to participate, she was given a difficult building canvas to work with; although the facade’s large size was not a problem, creating a mural around the building’s many windows posed a formidable challenge. Zumi resolved the dilemma by creating a honeycomb design. The painting process started early November of last year. Zumi’s artistic vision called for a bright and colorful mural that represented the many personalities of Halle. She also included a portion of the night sky in her piece to symbolize change and innovation. 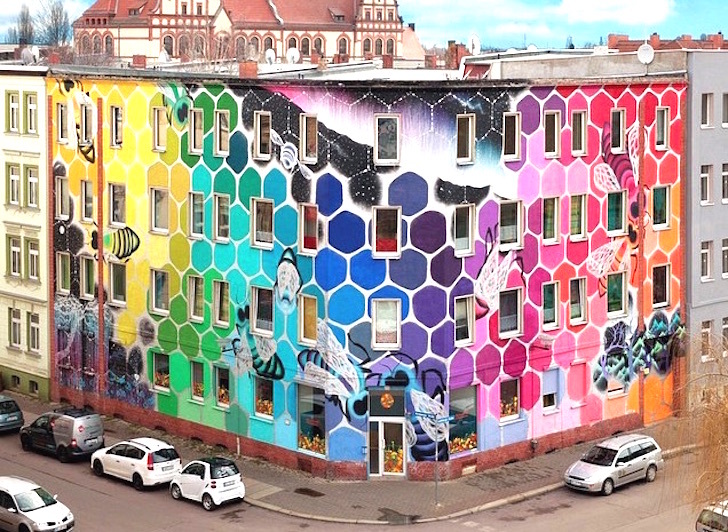 When Zumi arrived at Halle, however, she was so inspired by the work of the All You Can Paint Festival committee that she added 11 large bees into the mural, each representing a committee member. The ‘Honeycomb of Life’ mural also includes miniature landscapes and other small beautiful details.